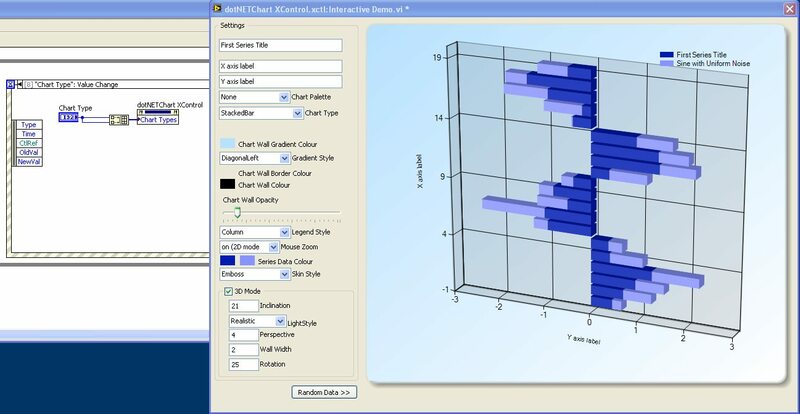 Following the demonstration of the Microsoft .NET Chart control in a previous document (here), I was challenged to create a more user friendly XControl. It's taken some time (we're all busy people) but here's the first draft! 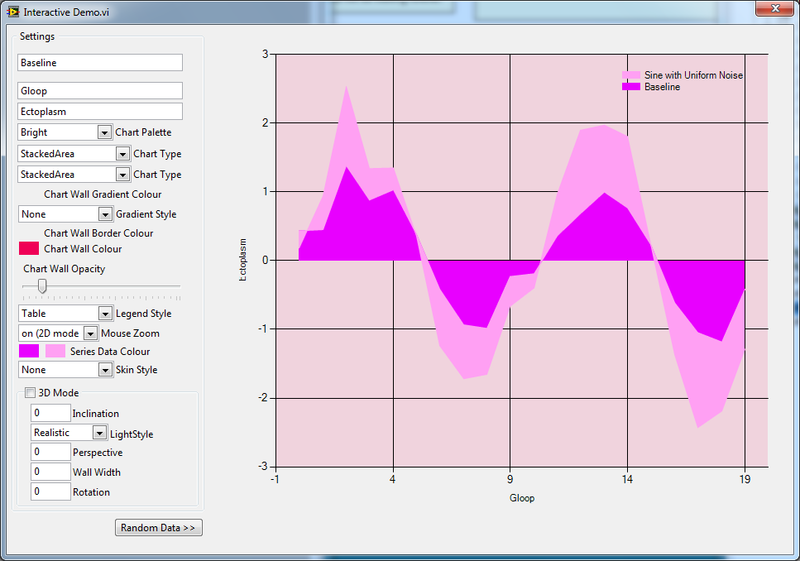 Attached is an XControl that encapsulates a Microsoft .NET Chart. Properties have been created to allow setting of parameters and an Interactive Demo is included to show how easy it is to implement the XControl. You'll need the Microsoft Charts toolkit, which is a very small download and absolutely free (download link). Change the plot type from Line to Spline to Bar to Area to Donut to Stacked Area 100 etc. etc. etc. Change the colours of the series lines, backgrounds etc. If you like the XControl, please leave a comment with suggestions on how to improve it. There are some colour options that need tweaking - there are soooo many parameters in the Microsoft Chart control that I got lost, so they're not all accessible yet. For some unknown reason, the opacity control sometime gets ignored when the plot is redrawn. Hi! This looks great, however I just tried to open the Interactive Demo.vi and a certain dependency is missing... System.Forms.DataVisualization.dll. I have Windows7 and VS9, is there a toolkit for these charts that i need to install? Yes, my apologies. 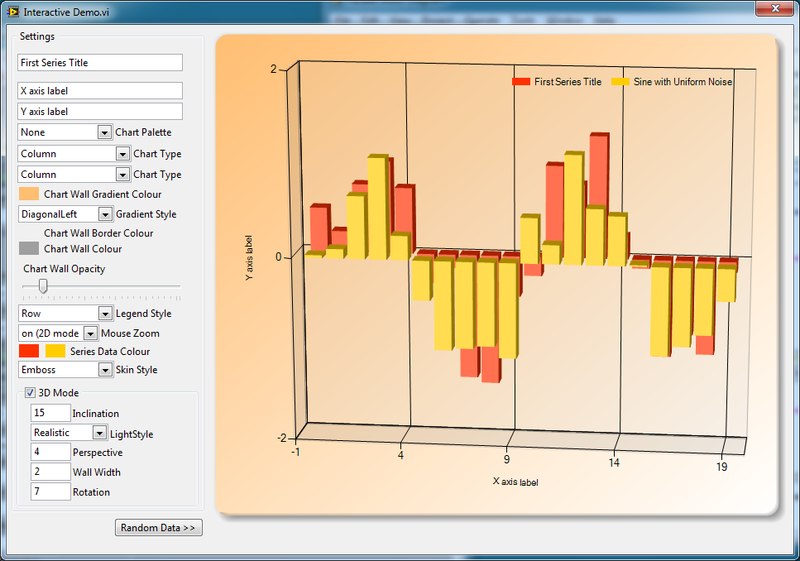 You need the Microsoft Chart toolkit, which is a very small download and absolutely free (direct download link). 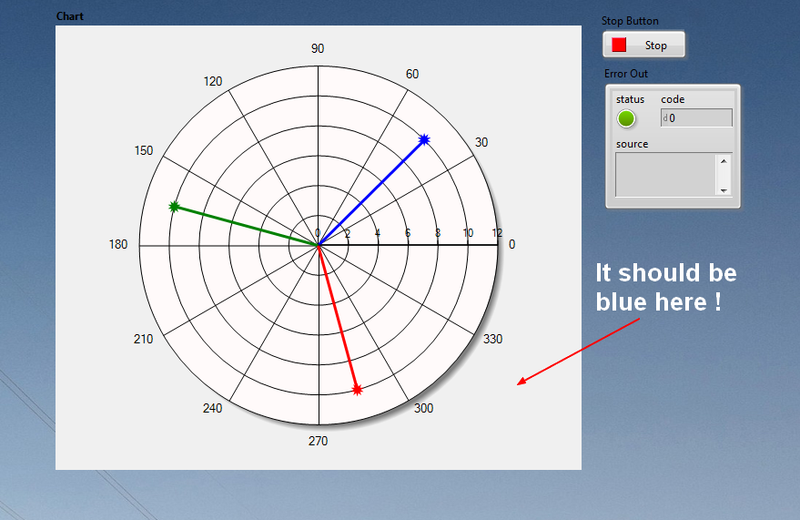 I referenced this originally in my Microsoft Charts In LabVIEW document, but forgot to include it here. This looks really cool. I can't wait to try it out. You've outdone yourself again! I truly appreciate anyone who breaks the ice with new LabVIEW - .NET applications. I currently have a need for using your XControl via either the Radar or Polar chart type - but only with one (1) channel of data displayed. Is this possible with the current XControl functionality ? Thank you. Hi KarlH, and thanks for the kudos! 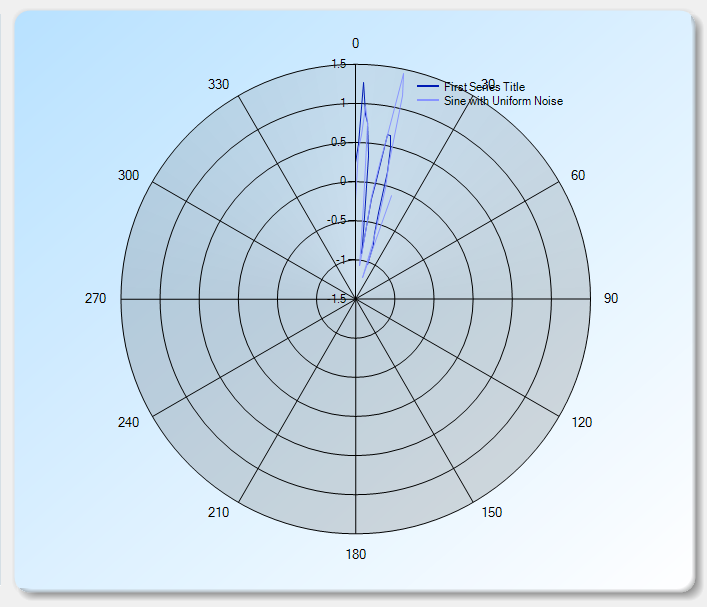 Yes, Radar and Polar plots can be done with the XControl, but not in the Interactive Demo (V0.1) as there's a little bug with the plot mode ringlist. I'm working on improving the demo to allow you to control these parameters better. I've added two snapshots to show the radar plot and polar plot modes, each showing two channels but you can plot just one of course. Very nice, Thoric! I think it is time to invest some effort on my part to learn X-controls! That being said - as a dumb user I did manage to throw an unhandled exception that forced me to have to actually close the demo and reopen it (I tried to use a column and pie chart simultaneously). Jeez, Thoric! Whadaya have a day job or something?! Hi there. Well done. Is it possible to use this control as an X-Y graph? Yes, it most certainly can. Use the Point chart style for (X,Y) data. There's also a FastPoint chart style, presumably for rapid updating or large datasets. I'm no familiar with using waveform datatype but that only has Y and dt (constant). I want X vs Y. Can you post an image on how to form the necessary datatype? Very basic question I know. Much appreciated. Also, how do you add/remove data series? When I wire my own data to the control terminal I still see the second random data series and in the legend. Can all the data series be reset? Thoric, what about an array of cluster of x and y arrays. This is versatile as both x and y and dt (constant steps in y array) can be used. I think anyone wishing to use an x control and .NET should be familiar with arrays and these techniques. Nice work! Hi everybody, Thoric are there any chances to have this for LabVIEW version 8.5? Hi uxpro - I'll see what I can do this week for you. Update - I've created a V8.6 release, but not tested it. I hope it works for you! Thanks a lot, Do you plan to go further with this Topic? Yes, I still plan to advance this control, but I've been working on a few other little personal projects recently. I never have enough spare time to finish anything it seems! Hi, yes, although the XControl supports StackedBar styles, the Interactive Demo causes a problem. 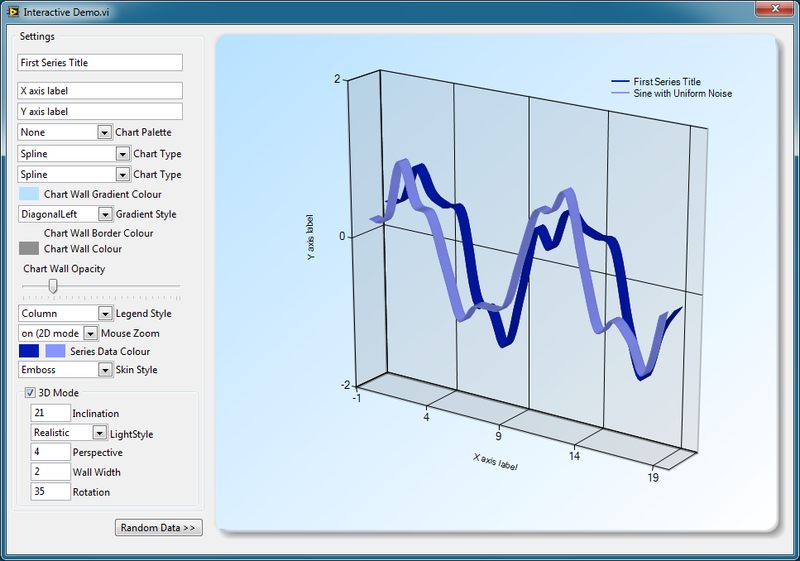 The stackedbar style cannot be combined with other styles, but the interactive demo will only let you change one plot line style at a time, so as soon as you change the first to StackedBar it causes a .NET Chart control error. Nice work here. You might consider splitting the xcontrol along the lines of the waveform graph and xy graph, i.e, make two xcontrols with bascially the same backend but with different input types. It's hard to make a single type to handle all graph types. Great job! 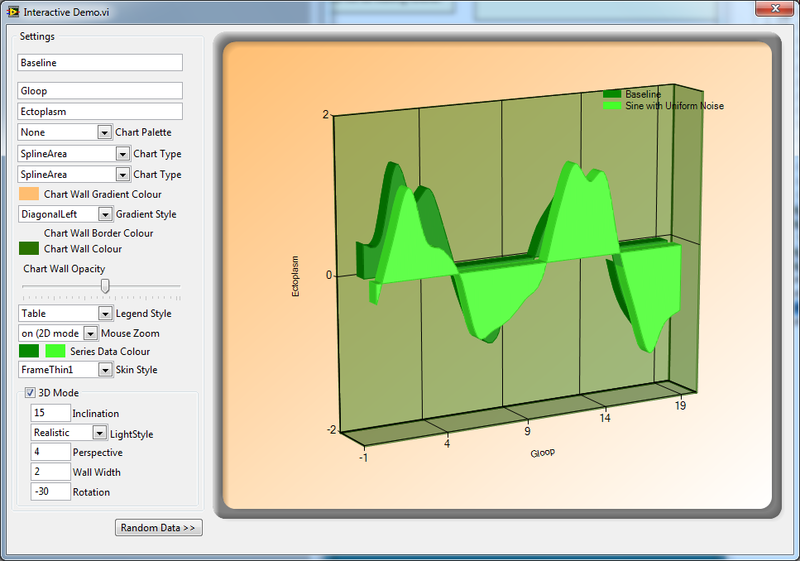 I am very excited to see better looking plots are obtainable in labview. Is there a way to modify the scaling of the x and y axis? I have an array of numbers that I want to enter into the x and y axis but I can not figure out which VI will give me access. Nice job withe the MS Charts ! Currently manipulating them, I'm facing a small problem : did you fin a way to have the back color transparent ? In my case, I can't get my VI background visible. It always stays grey even if I set the Chart.BackColor to Color.Transparent. Hi zyl7! Nice idea with the transparency, I can't recall trying that myself. If I get a chance I'll take a look later. If you figure it out let me know! OK, so I've been looking into this and it appears that the LabVIEW .NET Container object doesn't honour the transparency of the contained .NET class instance. 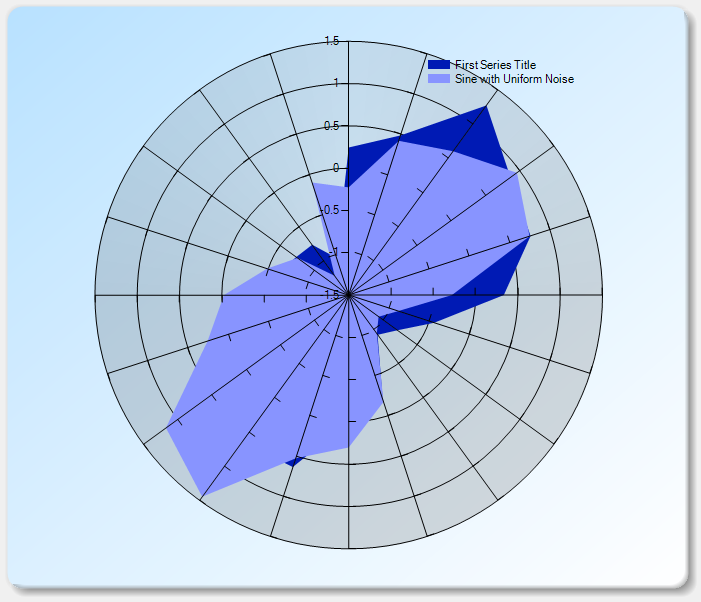 Therefore, although you can set a transparent background within the Chart control, LabVIEW shows this as a region of grey. Maybe one for the Idea Exchange? Is there a way to register events with .NET charts? I was looking for a maker property on a data point to make it movable, but couldn't find it. I believe I'll have to programatically change it's position using .NET events. 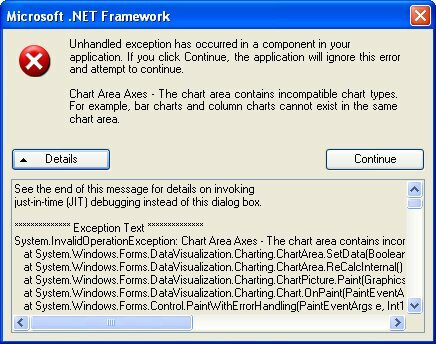 And, Yes, MS Charts have events to register. This is Excellent...! Could you please, guide me how to plot Polar Plot. Wow this is cool. Hopefully NI incoporates this into LabVIEW. Leverging the Microsoft Charts is very cool! - Expected Assembly "System.Windows.Forms.DataVisualization, Version=3.5.0.0, Culture=neutral, PublicKeyToken=31bf3856ad364e35", but found "System.Windows.Forms.DataVisualization, Version=4.0.0.0, Culture=neutral, PublicKeyToken=31bf3856ad364e35." It loads in my LabVIEW 2014 without any crashes. I have .NET 4.5.2 version.